5/23 Cup of Coffee: As has often been the case this year, the story of the night was the excellent play of the Salem shortstop. But this time, rather than Santiago Espinal, it was CJ Chatham (pictured) who powered the Sox in a wild victory. Chatham and company's 13-run outburst supported a strong effort from top active prospect Bryan Mata. Elsewhere, the Pawtucket bullpen stifled Scranton, while Portland and Greenville squandered good starts from Kyle Hart and Denyi Reyes. The PawSox put together consecutive wins for the first time since May 6th – incidentally, the last time they were hosting Scranton. Ramon Flores delivered a three-run homer in the second, and a two-run shot by Aneury Tavarez put Pawtucket on top in the third. Rusney Castillo was 2 for 4 with a run and stolen base, ticking his batting average back above .300. The bullpen turned in excellent work, allowing just one run in five innings. Tyler Thornburg struck out two in a perfect seventh inning as he nears his return to the Boston bullpen. Dustin Pedroia was scheduled to start at second base, but was held back due to rain in the area affecting the field conditions. Hartford has had the Sea Dogs' number this year, now having taken 10 of the 12 contests so far between the two teams. A strong start by Kyle Hart went for naught. The left-hander allowed three runs (one earned) across seven innings, striking out five without walking a batter. Josh Taylor, making his second appearance for Portland since coming from the Arizona organization, took the loss after allowing a pair of runs in relief. 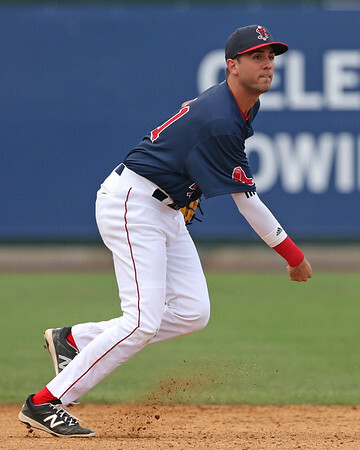 Luke Tendler led the Portland offense, going 2 for 4 with a solo home run. After getting off to a 12-1 lead, Salem held on as a wild Frederick rally fell short. It was a big night for CJ Chatham. Limited to DH duties for the last several weeks, Chatham got the start at shortstop and responded with a third-inning grand slam. Chatham added a double and a walk, and also committed an error. Tyler Hill added three hits and Roldani Baldwin homered as part of a two-hit night. Designated hitter Santiago Espinal, the regular shortstop and the system's hottest offensive player, led off the game by getting hit by a pitch. He remained in to run, but was pinch hit for in his next plate appearance. There is no word yet on the details of why Espinal exited. Bryan Mata had a strong start, allowing a run on four hits in five innings, striking out four. As has been the case for much of the season, control was an issue for the Carolina League's youngest pitcher. Mata walked three, hit a batter and uncorked a wild pitch. The bullpen struggled mightily as the Keys clawed their way back into the game, but Matthew Gorst slammed the door, ending the game with a strikeout and pop up with the bases loaded. A solid start by Denyi Reyes wasn't enough to keep the Drive from dropping their sixth straight. Reyes continued his excellent campaign, giving up just one run on four hits in five innings, striking out seven while walking one. The 21-year-old righty has now struck out 57 and walked only six in 50 2/3 innings. Marino Campana had Greenville's only extra-base hit, delivering a double as part of a two-hit, two-RBI evening. Lorenzo Cedrola added a pair of singles, his fourth consecutive multi-hit game. Player of the Day: After a 2017 season largely lost to injury, 2018 has been off to an uneven start for CJ Chatham. He had been largely unable to play the field in spring training. Then, after starting at shortstop in four of Greenville's first seven games, an injury limited him to designated hitter duty for six weeks. Despite his limitations in the field, the 2016 second-round pick had been showing promise with the bat, hitting .309/.336/.427 heading into Tuesday, including 11 for 35 in nine games after a promotion to Salem. Everything finally came together for Chatham, who played nine innings at shortstop and delivered a grand slam to lead Salem.